Sound (9.2/10) – The UE900 is the first Ultimate Ears flagship created under Logitech management. Replacing the Triple.Fi 10, a model that has been a staple of portable audiophiledom for the better part of a decade, the UE900 boasts a 3-way quad-BA configuration akin to that of the Westone 4. Despite UE’s new management, the 900 doesn’t stray too far away from the TF10 sound, opting to simply provide a more balanced and refined take on the signature. The Triple.Fi 10 has always been known for delivering ample bass courtesy of its 2-way, triple-BA driver configuration, and the new UE900 is certainly no slouch in this regard—its bass is deep, punchy, and articulate. The curve is flatter compared to the TF10, with more linear subbass extension and less mid-bass boost. The resulting sound is less warm compared to the TF10, though still warmer than sets such as the HiFiMan RE272 and VSonic GR07. The bass of the UE900 sounds tighter and more natural than that of its predecessor and the sound is not as colored. The only potential downside is that the UE900 is a touch less “bassy” in the conventional sense than fans of the TF10 may be used to. The UE900 is tonally on the warm side and the midrange has a mild downward slope. Lower mids are more prominent compared to the TF10, resulting in a sound signature with a much less obvious v-shape. Vocals are less recessed and the midrange sounds fuller and richer, making the mids of the TF10 seem thin in comparison. Upper mids are de-emphasized, however, resulting in slight veiling. Female vocals especially seem veiled and less intelligible compared to sets such as the HiFiMan RE272 and Sony MDR-7550. Treble response, on the other hand, is quite inoffensive. The UE900 doesn’t lack treble emphasis on the grand scale, providing a brighter sound with more treble presence than some popular triple-driver sets, such as the Shure SE530 and Earsonics SM3. That said, the top end is smoother compared to the TF10 and boasts less sparkle, continuing the UE900’s move away from the more v-shaped, more colored sound of its predecessor. The greater treble emphasis does make the TF10 sound a bit more energetic and can give it the illusion of greater clarity on some tracks but the smoother treble of the UE900 does a better job of avoiding harshness and sibilance. The UE900 also sounds more natural, avoiding the slight metallic tinge displayed by certain other BA-based sets. The presentation of the UE900 retains the best aspect of the TF10 – the width – but the more forward mids give its sound a less distant, more three-dimensional feel. Soundstage depth is good, easily beating out the popular VSonic GR07 and competing with the pricier Phonak PFE232. Instrument separation and imaging are good as well, providing an immersive listening experience. It’s worth noting also that the sensitivity of the UE900 is rather high compared to the PFE232 and similar sets—seemingly a common trait of all balanced armature in-ears from UE. In addition to the Triple.Fi 10 comparisons above, I took the chance to test the UE900 head-to-head against a few other high-end universal-fit earphones. What follows are brief notes based on lengthy comparative listening. The R-50 is a high bang-per-buck dual-armature universal based on the Knowles TWFK driver, a setup similar to UE’s lower-end 700 model. Compared to the UE900, the R-50 boasts a brighter tone with less bass emphasis and more treble energy. It has a thinner note presentation but provides better midrange clarity and more intelligible vocals. Unfortunately, the treble is also splashier and more prone to exaggerating sibilance. The UE900, on the other hand, is smoother and carries more lower midrange emphasis for fuller, throatier vocals. Its bass is deeper and significantly more powerful, though also a touch boomy in comparison. Both earphones have similarly spacious soundstages with good depth and width. The GR07 is an audiophile heavy-hitter, providing benchmark performance from a single bio-cellulose dynamic driver. Compared to the UE900, the GR07 provides better clarity and a brighter sound with tonality closer to what I would consider “neutral”. The UE900 is warmer and provides more mid-bass impact with similar sub-bass depth. Its sound is more dynamic, however, and it avoids the sibilance-prone treble peaks of the GR07 in favor of a smoother, less fatiguing presentation. The UE900 also pulls away in soundstaging, with better depth and layering that make the GR07’s presentation appear flat and overly distant. The RE272 is another audiophile favorite and the latest in a series of increasingly accurate in-ears from HiFiMan. Compared to the somewhat bass-light RE272, the UE900 is warmer and punchier, with an overall presentation centered more on the bass and lower midrange, and a slightly “boomier” bottom end. The RE272 is more transparent and boasts better vocal clarity and treble sparkle, as well as better instrument separation. Its soundstage lacks a bit of depth in comparison, however, giving the UE900 an edge in layering and imaging. Phonak’s flagship uses a dual armature setup but still manages to deliver sound that puts it near the top of the universal earphone game. The sound signature of the PFE232 is noticeably v-shaped, with more recessed mids and added treble energy compared to the UE900. The top end of the PFE232 is more crisp, sparkly, and extended. The low end of the Phonaks also presents less mid-bass emphasis for a slightly cleaner sound. The UE900, on the other hand, still manages good bass, both in depth and impact, but also provides more prominent and less grainy mids compared to the 232. Its presentation also has slightly better depth in addition to great width. The priciest universal-fit headset on the planet, the K3003i is AKG’s sole entry into the high-end in-ear market. Compared to the UE900, the dynamic bass driver of the K3003i provides more mid-bass impact and slower bass decay while the balanced armatures attain better top-end extension and crisper, more detailed sound. Its presentation is also more airy and layered better than that of the UE900, though the latter is definitely no slouch. The midrange of the K3003i is more recessed, however, with the UE900 providing better balance between the bass and mids. The UE900 also wins the smoothness battle as the AKGs are more prone to exposing harshness and sibilance. The TG334 is a flagship custom-come-universal from Japan-based FitEar. The UE900 puts up a good fight in this unfair comparison but the TG334 earns its otherworldly price tag with a noticeable jump in clarity and transparency over the UE900. The veil of the UE900 was most noticeable next to the FitEar—the more forward midrange of the TG334, despite the powerful bass, carries no veil whatsoever. Microdetail is brought forward and made more discernible compared to the UE900 and instrument separation is improved as well. Finally, the bass of the TG334 is also more dynamic and capable of delivering greater impact when called for. Value (8.5/10) – With such a widely revered predecessor and an even more easy-going sound signature, the new Ultimate Ears UE 900 is a high-end earphone for the masses. The outgoing Triple.Fi 10 is still an audiophile icon but after more than half a decade it is undoubtedly a bit long in the tooth. The UE 900, despite the steep price tag, is a well thought-out replacement, both sonically and as an overall package. It provides better ergonomics, optional headset functionality, and an improved cable, as well as punchy, smooth, non-fatiguing sound that doesn’t butcher low-bitrate tracks. It’s not perfect, but with the UE 900 as its replacement the TF10 certainly won’t be missed by many. How do you judge ue900 today vs. Ibasso it01? I love the bass and midbass of the latest but I love also the detail coming from ue900..
From your comparision review it looks like old TripleFi ismore similiar to AKG3003 and PFE232 (recessed mids, more sparkly highs etc) than to UE900? So whats the weakness of TripleFi comparing to AKG and Audeo if tonality is similiar to both? Because I assume if I love TripleFiand would like to get something better I should look at these two mentioned from universals? Yes, I don’t think the UE900 is tuned to sound exactly like the Triple.Fi10 – I think UE consciously went for a flatter/more reference sound for this newer model. The TF10, K3003, PFE232, etc are similar in the sense that they are all more “v-shaped” than the UE900 – i.e. the bass and treble are boosted relative to the midrange – but they differ in other ways (for example the more impactful bass of the K3003 compared to the TF10). There are dozens or even hundreds of other v-shaped earphones on the market and they all differ in how far in the “v-shaped” direction their sound tuning is For example, the sound tuning of the Unique Melody 3X has a “v-shape” so severe that it actually sounds far more different from the Triple.Fi10 than does the Triple.Fi10 from the UE900. My point is to keep in mind that sound tuning is a matter of degrees and try to figure out whether what you’re looking for is something that’s as close as you can get to the TF10 sound tuning, preserves the general sound tuning but takes it in a certain new direction, or maybe something else entirely. Hi ljokerl ,Im a guitarist + backing harmonies , my current headphone I’m using is AKG IP2 . Im looking for more of a flat or reference sound,Could you pls suggest me a good headphone or compare SE535ltd and UE900 ? Not familiar with the AKG IP2. UE900 and SE535 are both good for reference sound, SE535 tends to be a little more midrange-focused and smoother, while UE900 is a little more capable when it comes to sub-bass and upper treble (neither of which is likely to be a dealbreaker for you). I’d just go with whichever one you think will fit you better, and maybe consider the price difference a factor as well. Could you call this an upgrade from a Brainwavz B2 user? TIA. Depends on what you don’t like about the B2 – if you think it’s a little too thin-sounding and would prefer something smoother and with a bit more bass weight/impact, these would be solid. If you’re looking for an upgrade in any of the things the B2 does well – clarity, detail, resolution, etc, UE900s are not the answer. I can’t give you percentages but the UE900 is more sensitive than all of those dynamic-driver IEMs, so it’ll be louder at the same power input. They are similar in the sense that both strive to deliver a relatively balanced and accurate sound. Compared to something radically different, like a Beats in-ear, the UE900 and RE400 will sound very similar to each other. However, the way the UE900 and RE400 go about sounding neutral is somewhat different. The UE900 gives you a brighter, more crisp sound with deeper bass extension – even emphasis across a broader frequency range, so to speak. The RE400 is more mid-centric and has smoothed-over treble and slightly subdued deep bass in comparison. Its mid-centric sound also takes away from the soundstage width somewhat. To my ears more analytical earphones like the UE900 always sounds less dull than the RE400, but again if you’re comparing them to something radically different, like the AKG K3003, the UE900/RE400 may well be interchangeable with each other. First of all a big compliment on the best IEM guide in the world! I need a little help. I really don’t know where I stand right now. I bought my Logitech UE900 some time ago because it seemed like the best choice for listening to classical Music in an analytical way (I’m no audiophile, just a music student). Now that Quad-ba IEMs are out of fashion I wonder if there are IEMs under 400 bucks that are an upgrade to the UE900 in terms of neutrality and detail reproduction. Some people say that basically every good single dynamic IEM for 100 bucks will be better, others say that I’m still solid with the UE900. For me the UE900 is still an awesome earphone for critical listening and if there’s something better out there for $100 I’d love to hear it. Would I recommend the UE900 to someone today? Maybe not, but not because you can do much better. Mostly because it’s several years old and you can get something comparable for a little less $ these days. But if you already own the UE900, that’ll be a sidegrade at best. I was able to compare the UE900 to the hifiman re-400 and the UE900 were much better. I think they would be a great recommendation if their price tag was like $250 or so. You can pick them around 240-280 without a problem. I’ve recently been considering a CIEM, for mostly comfort reasons, and to maybe take the “next” step in audio quality. My IEM for the past 1-2 years have been the ue900, and I really liked the sound signature from it, but wanted something more comfortable. Are there any CIEM’s you can recommend that has a similar signature? That would also be considered an Upgrade? I looked at the link and saw that the 1964 V6-Stage has similar signature and performance, for less, would you say that it would be a good way to go? (I was considering these). The V6-Stage is indeed comparable, but it’s not as smooth as the UERM, which itself is already less forgiving than the UE900. So the total gap in treble intensity from the UE900 to the V6-Stage will be sizable. If that’s not a problem for you then the V6-Stage is an awesome value. Also, keep in mind that the UERM I tested was a universal demo unit and the custom UERM may perform even better. My V6-Stage is of course a proper custom. I have had a set of UE900 for around 3 years but recently I’ve ‘misplaced’ them! Anyhow I’m on the lookout for a replacement/upgrade and I was wondering if you had any suggestions? Was considering the 1964 U4 or perhaps the RHA t20i or even the Westone W40. Do you have any thoughts given the black friday sales are fast approaching!? I should have mentioned I am just running them directly from my iPhone 6 on my daily commute to work. Not familiar with the 1964-U4 but I would skip the other two unless the UE900 was too neutral for you. The T20i has enhanced bass and emphasized upper mids compared to the UE900. It’s not as accurate – the sound is more on the fun and energetic side, while the UE900 is more of a reference earphone. Similarly, the W4 has a sizable mid-bass hump compared to the UE900, so it has warmer tone and poorer clarity in comparison. There are universal options that pursue a more accurate sound that wouldn’t be a step down from the UE900 – for example the Audiofly AF180, InEar StageDiver SD-2, and perhaps the Audio-Technica ATH-IM02. Just not the T20 and W4. Unfortunately you’re not too likely to get a black Friday deal on a more niche earphone like one of these, so maybe the 1964 is a good option if there’s a discount. Thanks mate. I do prefer the reference sound of the UE900 so I will look into those options you gave me. Thanks so much. I am expecting 1964 to do 15-20% off on black friday so might be a good option there. Do you have any experience with any of their models? Yeah, a few, but only customs – the old 1964-T and the current 1964-V3, V6-Stage, and ADEL A12 (demo). The V6-Stage is awesome for a reference sound while the V3 is more of a fun-sounding earphone like the T20. Awesome thanks for your help I really appreciate it. 64 have got 20% off for their BF sale! What about the Westone W50 mate any experience with it? Sorry, haven’t tried the W50 or W60. Very impressive layout you have. Wow, I am extremely impressed. I am looking to purchase a universal-fit IEM. and what is you first choice for the “best value” IEM? My favorites were the Ultimate Ears (Logitech) Triple-Fi 10’s and the UE 900’s. I ended up returning my UE 900’s due to connectivity problems. I had my Triple-Fi 10’s for quite a while and I loved how they sounded. That’s quite a loaded question – most people agree that there’s no absolute best because everyone has his or her own sound signature preferences, and even then not everyone will agree what the absolute best earphone with enhanced bass or the absolute best balanced-sounding earphone is. Me, I quite like the AKG K3003 among top-tier universals. I don’t think it’s a great value or anything, but if price is no object that’s the one I would have (out of the ones I’ve tried, at least). Thanks for the answer. It’s amazing you take time to answer every single inquiry. It’s not that I seek enhanced bass, it’s just that public transportation here in Istanbul has an expertise in killing the bass response. I’m more of a mids-lover I think. So UE900 is clearer despite the aforementioned veil? Which one has the upper hand in soundstage? Also how would Vsonic VC1000 fare against them? The UE900 has the upper hand. You are right about outside noise killing bass response – just need to balance out the noise isolation and bass enhancement level against it when choosing what you buy. The VC1000 is tune very similarly to the Rock-It R-50 that I compared above, just a touch less bright. It still compares to the UE900 in the same way, though. For the last 3 years, your reviews have been my primary reference for my purchases. I’m a happy owner of a Sennheiser Amperior, Beyer DT1350, Creative Aurvana Live and a TDK IE800. 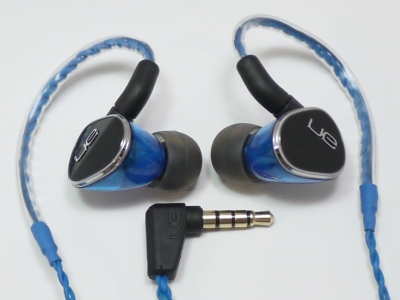 Lately I’ve been looking to expand my IEM collection and I had two options in mind; Logitech UE900 and Westone 4. I listen to metal, rock and classical (mostly orchestral) though metal, especially technical stuff with lots of complex parts and polyryhthm, takes most of my listening time. Instrument seperation, clarity and micro-details are important for me. Prominent mids, some sub-bass presence and energetic yet, non-sibilant treble are also on the list. Isolation is a must. I do like my DT1350 a lot, though it feels as it becomes a bit grainy/distorted and nasal when hectic stuff starts aside from that it’s like the whole package. It’s sub-bass also satisfies me for the most part. Amperior’s clarity and liveliness does it for me and I don’t care much for mid-bass. IE800 more than occasionally strike me as sibilant and other than lack of sub-bass, I enjoy them a lot. My budget is around $200 (+-$30). I plan to buy either used (I can’t afford a W4R, lack of detachable cables kinda wories me). So with that wall of text in mind, which one would you recommend me? Also other suggestions would be more than welcome. Thanks for your time. Thank you, glad to hear that. For what you want, it sounds like the UE900 would be the better option anyway – its flatter sound sig just works better on busy passages than the slightly darker/bassier W4. I haven’t tried the IE800 from TDK, but the W4 and UE900 are both BA IEMs and don’t have enhanced subbass response. If what you want is a flat, maybe slightly bright sound with very nice resolution, the UE900 is awesome. If you want your treble slightly smoothed-out or your subbass lifted, it isn’t the best option. But again, not having tried the IE800 I’m just not sure where its bass and treble levels are at as a starting point. was going to buy yamaha eph100 and then read about Ultimate Ears UE 900.
they are both warm sounding iems….and both have good reviews…not sure which one to buy. may be u could compare them so i could decide. also on head-fi there is a lot written about the manufacturing/build quality issues with UE 900…did u notice anything like that? i also read that a revised edition “ue900s” was announced by logitech which supposedly addressed the issues with original ue900 (which i am unable to find anywhere). have u listened to “ue900s” as well? I haven’t had any issues with my UE900 and wasn’t aware there’s a new version but in any case I would not recommend the UE900 for a warm sound over the EPH-100. It’s really more neutral than warm. Okay! Can you please compare them in these 3 different fields ? So which one of them have better bass quality (not quantity). Which one of them offers more detail? And in terms of presentation imaging and soundstage which one wins? Quality, detail, and soundstage width – UE900 wins. Its bass is very level and the clarity is excellent, which helps with pretty much everything. The EPH-100 has very good soundstage depth and a warm, bass-heavy sound signature but if you’re talking about overall fidelity/accuracy the UE900 takes it. Just doesn’t have as warm a tonal character as the EPH-100. Can you suggest me few warm sounding iems which has very good amount of air in its spacious stage as well as with the excellent instrumental separation and better imaging with capacity for front-to-rear positioning so I can see if I can find any one of them in my country (India). what sound signature SteelSeries Flux In-Ear Pro has? and now warm sound signature aside do you think Brainwavz B2 are absolutely nonforgiving? Off the top of my head, TDK BA200, the EarSonics models I’ve tried, Sony MDR-7550, and the StageDiver SD-2 (kind of hard to justify in comparison to the BA200 because the signature is similar). The Flux In-Ear Pro is definitely warm and smooth but it’s not quite up there with something like the UE900 or BA200 in soundstaging and separation. Lacks a bit of treble energy as well. The B2 is quite unforgiving, which is not to say it’s a bad earphone.